Home > Graduate Programs > Go > Why GTL? Georgia Tech is highly ranked. Access to Georgia Tech's renowned innovation ecosystem. Home to GT-CNRS UMI 2958, a joint international research laboratory. Base for the Lafayette Institute, a leading facility for the commercialization of optoelectronics. All students, including international students, pay Georgia Tech's in-state tuition. Subsidized housing for students staying two consecutive semesters or more at Georgia Tech-Lorraine. Spend one or two semesters in Metz, France, or complete your entire Masters or PhD at Georgia Tech-Lorraine. Courses offered in Fall and Spring semesters. Students admitted to the Lorraine campus can transfer to the Atlanta campus after two semesters of study. 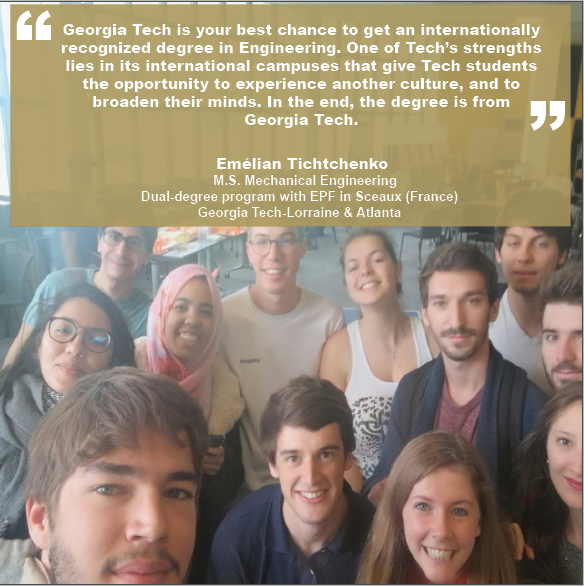 Complete a Dual-degree Program – Earn a degree from Georgia Tech and a degree from one of our top-tier partner institutions in Europe and North Africa. Opportunity to participate in the Global Engineering Immersion Program (GEIP), spending one semester at Georgia Tech-Lorraine, one semester at Georgia Tech-Shenzhen, and one semester at the Georgia Institute of Technology in Atlanta. Please contact Dr. Bertrand Boussert for more information on partner institutions or academics. Please contact Elise Bastien for information on applying to the dual-degree masters program.